Three Phases of Sustainability: Where is Your Organization? Organizations usually go through phases when implementing sustainability practices. Understanding where your organization is in the process can help you foresee upcoming challenges and avoid overstating your progress (i.e., greenwashing). Re-imagine what business you’re in long-term. The first phase, Sustainability 1.0, is mostly about cleaning up messes: reducing impacts, dealing with any public relations debacles and assessing risks. Nike, for example, got interested in sustainability after it was embarrassed by damning articles about the labor practices in its suppliers’ factories. Company management wanted to know what other problems might be flying under the radar. Sustainability gave Nike a lens to consider threats. While the current public relations problem was a social sustainability issue, the next would likely be environmental. The company began to see how everything was connected. Most organizations, however, start pursuing sustainability simply to save money. They may not even realize they are doing projects related to sustainability. They think of it as trying to save energy, reduce waste and cut back on water. But this is an important foray into the field of sustainability. As they gain recognition about their efforts, their own self-image as environmentally-aware companies often spurs them on. In this phase, social issues often take a back seat—unless they were at the center of a public uproar—since environmental issues tend to be more tangible. If you’re in this phase, be careful about going public about your sustainability efforts. Wait until you have more to show for it. That said, this is a good time to start reaching out to all of your suppliers and service providers. They often have more sustainable options to offer but the default, unfortunately, is usually to give their clients the business-as-usual, less-sustainable offerings unless you ask. "… Superior climate engagement, as measured by the difference between Q1 industry leaders and Q5 industry laggards on CDP disclosure scores, portends a 'quality premium' equivalent to +5.2 percent return on equity; +18.1 percent cash flow stability and +1.6 percent dividend growth. Further, there is no observable valuation premium for Q1 industry leaders, presenting an attractive opportunity for investors: superior climate change engagement and superior profitability with negligible valuation premium." If your organization is in Sustainability 2.0, build a plan with full sustainability as the ultimate target. (We recommend the backcasting process associated with The Natural Step, a science-based sustainability framework.) Do not claim you’re a sustainable company, but instead speak honestly and publicly about what you’re doing as well as your challenges. Think carefully about how to roll out sustainability in your offerings: Do you want to have a sustainable line or will that only make your traditional products or services pale in comparison? At some point, though, organizations experience a major epiphany, realizing their efforts within their existing business model are clearly never going to be enough to achieve full sustainability. Think of Interface's late Ray Anderson and his 'spear through the chest' when he realized what his company did (making carpet from oil) should be illegal. Sustainability 3.0 involves challenging the business model and taking responsibility for a serious world or community problem that an organization is well positioned to help solve. Organizations in this third phase broaden their focus from just serving customers (making quality products and services) to solving the serious challenges (social, economic and/or environmental) in the larger community (local or global). It was always energizing to help our clients begin to envision their role in Sustainability 3.0. Marsha Willard, my former business partner, was facilitating our sustainability planning process with an engineering firm that specialized in waste water treatment facilities. When the engineers examined the impact of their services, they got into a conversation about the natural water cycle, which has nothing to do with funneling water through concrete pipes to a centralized facility. There was a moment when they realized that their approach to their core service was unnatural and unsustainable. What if people didn’t need pipes and pumps and waste water treatment facilities? Their entire body of work would go away! They’d be out of business! After a stunned silence, the engineers broke through the limitations of their existing business model. They decided to develop expertise around on-site treatment technology that would more closely mimic nature. They knew that demand for their existing services would not disappear overnight, but this gave our client an insight into a more sustainable business model that they could evolve into. This insight put them ahead of their competitors, a powerful differentiation. Once you get those ah-ha’s, build a realistic long-term strategy to get there. This article was adapted from "Great Work: 12 Principles for Your Work Life and Life's Work." Darcy Hitchcock is the author of a number of award-winning business books including "The Business Guide to Sustainability" (now in its third edition). 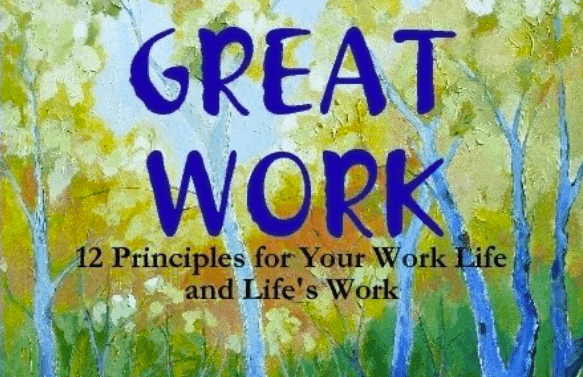 In her latest book, "GREAT WORK: 12 Principles for your Work Life and Life’s Work," Darcy shares what she has learned about finding a calling, making a difference and leading organizations. It’s available in print and also three e-books: "Finding Your GREAT WORK," "Designing Organizations for GREAT WORK," and "Leading Others to GREAT WORK." Learn more at Darcy.Hitchcock.wordpress.com.